And now the last installment of our week of Doctor Who countdowns! You've seen Kyle and Hannah's picks, now I countdown my favorite episodes from the revived series. 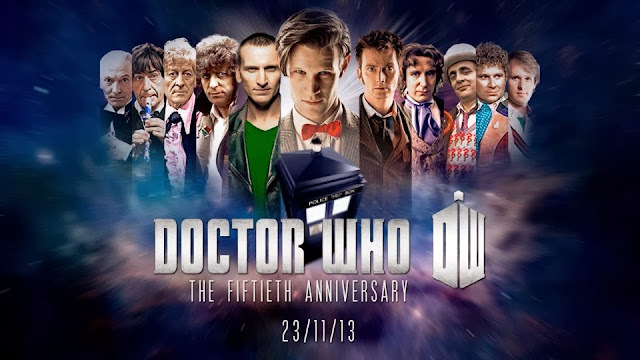 As if you need anything more to get you psyched up for the 50th Anniversary Special, airing this Saturday live worldwide! I’ll admit it--I love time travel paradoxes. When I started watching Doctor Who, I was slightly disappointed as they are typically quickly explained away with a few notable exceptions (Father’s Day being a great one). Instead of having monsters that simply resolve paradoxes, this sixth season episode explores the moral consequences by having that resolution placed in the hands of The Doctor and Rory. Amy is accidentally left to fend for herself on a hostile planet for 36 years, but the younger version still exists. 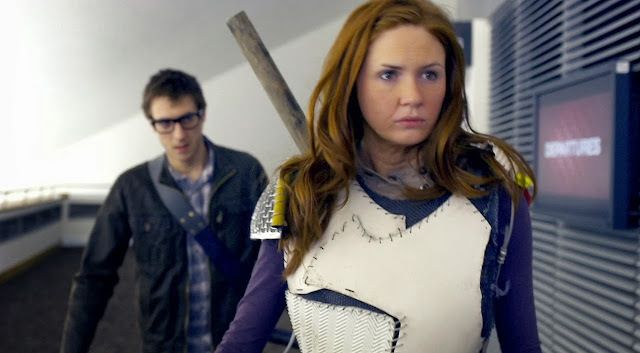 The Doctor and Rory essentially have to choose: do they save the young version of Amy or the bitter, war-hardened older version? It’s a bit heart-breaking and more than a little thought-provoking, which makes it my number five! The first season of the revived series had a few fits and starts, but its second two-parter is probably the best of Christopher Eccleston’s time as The Doctor. 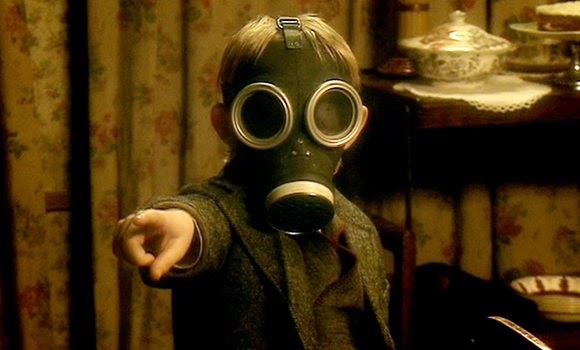 Most Doctor Who episodes like to leave you in the dark for a while so that you solve the mystery as The Doctor and his companion do, and The Empty Child provides one of the strangest mysteries of all: in the middle of The Blitz of London, people are being contaminated by something that turns their faces into gas masks and has them repeat endlessly, “Are you my mummy?” Weaved into this interesting puzzle, Rose is introduced to the charming Jack Harkness (among Russell T. Davies’ best creations) as a sort of ‘cooler’ version of The Doctor. 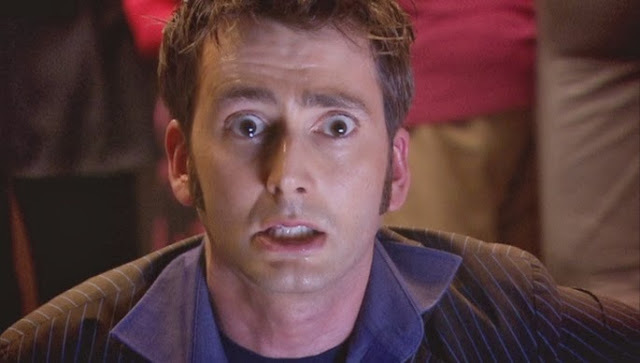 It soon becomes clear that Jack is not as wonderful as he seems, and of course, The Doctor holds the moral high ground as he begins to discover what is going on. The explanation for the curious disease is among the cleverest of the series, but the triangle of The Doctor, Rose, and Jack is what really sells this one. The three have an interesting chemistry of romance, jealousy, and one-upmanship that is quite entertaining, and the classically creepy empty child provides the perfect catalyst for them to come together. Doctor Who rarely ventures into fantasy or religious territory, but that’s what makes this one so interesting. It’s full of juicy sci-fi tidbits: a planet impossibly orbiting a black hole, the telepathic aliens known as the Ood, and The Doctor wearing a spacesuit! The episode turns towards the horror side of things when we start to realize that some ancient, evil presence is taking over members of the crew. Although the possession voice is a bit on the hokey side, the red-eyed Ood are a mysterious, creepy threat. Soon, the Doctor heads down into an sealed pit and encounters...Satan. Yep, you read that right. The Doctor confronts the real, absolute evil that is as old as the universe. The juxtaposition of hard, space-based science fiction with a physical version of a philosophical concept makes this two-parter a unique one that elevates The Doctor quite literally into God territory. One of the things that drew me to Doctor Who in the first place is its ability to do a lot with a little; in general, it relies more on clever storytelling and great characters than on fancy special effects. Midnight is an absolutely shining example of this. The episode begins lightly enough, with The Doctor and Donna vacationing on the Planet Midnight. However, as the ominous name of the planet suggests, things soon get quite dark. While in a shuttle to see a sapphire waterfall, shielded from the planet’s poisonous sunlight, the Doctor and the other passengers get stranded. There is some unknown, unseen creature that wants in the shuttle, and it does so by ‘stealing voices’. It possesses a woman, who then repeats what everyone is saying, but the delay on the repetition shortens until she is speaking simultaneously with the others. This is an incredibly creepy way to portray an alien incursion, and it immediately draws out the worst in the shuttle’s passengers, who plot to throw her outside. This episode does what all great sci-fi should do: it shows the worst in us, but shows how we can become better. Midnight is one of the most tense, brilliantly suspenseful, and simply executed episodes of the series. It starts simply enough as a visit to the universe’s largest library. It soon becomes one of the most complex stories in Doctor Who--at least the most complex that is resolved with minimal handwavium. 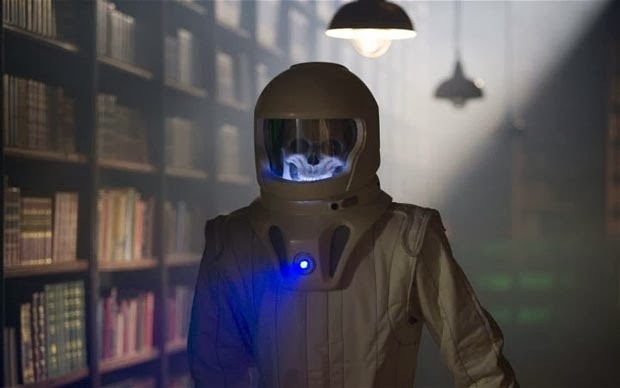 There are so many wonderful concepts thrown into this one: the introduction of River Song (before she was overused), who befriends the Doctor in reverse chronological order; the Vashda Nerada, the living shadows who create the coolest looking monster ever, a skeleton in a spacesuit(! ); a moon that is one giant external hard drive; communication devices that store and repeat thoughts, even after death; the list goes on and on. 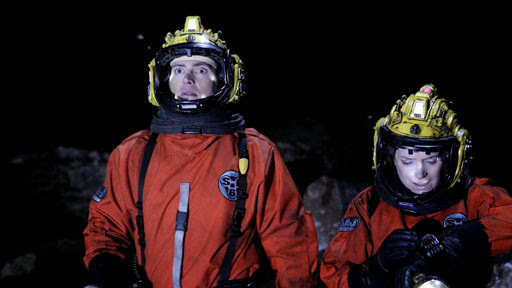 This two-parter sees the Doctor at his most fragile and frustrated, while Donna fights to escape a suspicious paradise. These two episodes are equal parts terrifying and wonderful, classic and inventive. Plus, it’s got one of the series’ most clever explanations, one that makes you say, “I can’t believe I didn’t figure it out!” I won’t spoil it, just go watch it. Now! Make sure to include all these great episodes in your own 50th Anniversary Special preparation marathons! See Kyle's and Hannah's picks for more great suggestions. Those are our favorites--what are yours? Let us know by leaving a comment or talking to us on Twitter or Facebook!